Lay on the mat in Sivasan (corpse pose) and simply allow the breath. Prepare yourself to do this first part of the kriya with all the delicacy and care of a lover. Be that person for yourself. Begin by raising one hand and then kissing the centre of your palm as in photograph 1 (top). Make that deliberate noise a kiss can make and treat this also as something sacred. Then lower the first arm and when it reaches the ground raise the other arm and bring that upturned palm to your mouth. Continue for 11 minutes with full attention. Next bend both knees as in photograph 2 (middle) and be sure to place hands comfortably so you do not need to move them again. Proceed to straighten legs as in photograph 3 (bottom) and then bend. Do this comfortably, rhythmically and as slowly as you like. You are flushing toxins now from the system. If any of your joints resist move very slowly and continue with love. In my experience just beyond that resistance comes a release of much holding on. Continue for 15 minutes. When you are done bring your legs gently to the ground and then lay in Sivasan and rest. You will notice renewed circulation throughout the physical body and you may feel a tender awakening in the subtle body as well. It is happening. Also very happy knees and a welcome energy shift in the heart. If you love this kriya do it every day for two weeks, and then let the changes in your environment decide. I chose the above kriya for my practice today because yesterday I injured myself. I was coming out of shoulder-stand into Karna Pindasan (knee to ear pose) and felt so free in that moment that I decided to fold further inward to my own snail-like start. This both worked - and it didn't. My spine curled easily but my more stiff hip took fright. When I came out of the posture I felt something lock and then I had limited movement. At present I am blessed to be at Chamundi Hill Palace Ayurvedic Resort in Kerala, India and the following is not advertorial, just fact. For my constitution, disposition, rhythm, appetite and heart; everything at this Ayurvedic resort is perfect. When 'my girls' came to get me for dinner (I was still on the mat doing pelvic tilts to facilitate getting up) I could stand and walk but with much difficulty. After dinner different girls packed my sacrum and right hip area with sweet Ayurvedic mud (a layperson's description) followed by medicinal plant leaves and then everything was held in place by a cloth wrapped around my hips. This morning I was 30% better and ready in some way to visit the mat. The above kriya was perfect for me today because it meant I could go deep yogically without hurting myself. I am now 50% better and climbing. There is a yoga posture, meditation and/or kriya for every grade of ability, disability and mood. Over time I have figured this out for myself and I wanted to share it. 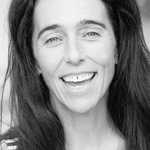 If you would like more information about what I do - yoga-side -please visit www.realrevolutionhealing.co.uk.